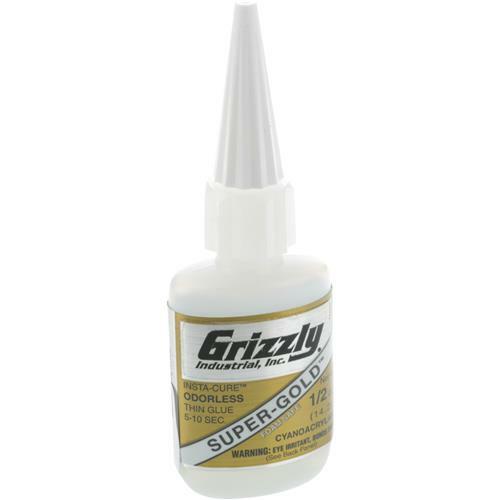 Grizzly H0919 - Super Gold™, 1/2 oz. SUPER-GOLD is an odorless INSTA-CURE CA. It is non-frosting and take only 2 or 3 seconds longer to bond. There are no fumes that irritate the nose and eyes. It does not attack white foam; therefore, it can be used in the building of foam core wings and the assembly and repair of plastic and foam ARF’s. They will not fog clear plastic. Whenever a large amount of CA is to be used in such applications as saturating fiberglass or Kevlar, SUPER-GOLD™ eliminates the irritating fumes from the evaporating monomer that make repeated use of CA unpleasant at times.